Who is this guy, where is Mammoth Lakes, and what's with the ghost town anyway? About the artist . . . (No, not much. YOU CAN STILL SEE James J. Otts establishment in historic Nevada City, California. The sign out front reads Assay Office, same as it has for 150 years. It was there, in 1859, that two weather-beaten prospectors showed up after having crossed the Sierra Nevada (Snowy Mountains) with samples from their modest gold diggings in the godforsaken wilderness beyond. They complained to the assayer that this heavy black sandy muck was clogging their rocker (gold washing device) and what the heck was it anyway? Theyd been shoveling away mountains of the stuff to get at the few meager flakes of gold that bought them their beans. Ott did a few tests and then told the argonauts that the heavy black muck was the purest silver ore hed ever seen. Per ton, they had about $8 worth of gold versus $3,000 of silver. Oh. Its not recorded what the prospectors did after receiving the news. In all probability, they went to the nearest salloon and drank a lot. News traveled fast by word-of-mouth in those days. The next time Ott stuck his head out the door, much of the town of Nevada City had been boarded up and abandoned. Half the population had decamped to follow the two desert rats back across the Sierra Nevada to their diggings, which soon became world famous as the fabulous Comstock Lode, the incredible mountain of mineral wealth that created the state of Nevada, financed the Union side in the Civil War, and turned pre-earthquake San Francisco into a city of gaudy millionaires and gingerbread mansions. Dont feel sorry for left-behind James Ott. The family did all right. A few blocks from the assay office, you can still see the Ott Mansion, pretty gingerbready itself, on Nabob Hill. Ott had been an immigrant, and word got back to das alte land that Caleeforneeya had a lot to recommend it. Other Otts eventually showed up on the doorstep. The author of this website is descended from one. THE SAME YEAR that James Ott was missing out on the Comstock Lode, another poor prospector named Wakeman S. Bodey froze to death in a Eastern Sierra blizzard soon after finding his own marginal gold prospect in the good-for-nothing-else sagebrush-covered hills immediately to the north of Mono Lake. This was on the very backside of California, a short walk from Nevada, which, of course, didnt exist yet. It was five months, March in fact, before the snow melted and the ground thawed enough for Bodey's mates to plant him, and by that time, the coyotes hadn't left much. Despite Bodey's sad end, word of his discovery got out. As the weather warmed up, more drifters showed up to the new diggings and located their own claims. The diggings became a camp, the camp became a district, the district became a town, the town ballooned after some rich hard-rock discoveries, and by 1880, 10,000 adventurous gold-seekers and their dependents, plus the hard-bitten merchants and barkeeps that sold them shovels and beer and their dependents, made their way to this clapboard metropolis in a nothing corner of a nothing country, accidentally named Bodie instead of Bodey by a sloppy signpainter. The West was seldom wilder. Fifty saloons and fifteen dance halls stayed open all night. A day without a shooting was noteworthy in the local newspaper. The Bad Man From Bodie became a new stock character in the dime novels. Everyone was in a hurry to get rich, and the law and nineteenth-century church-going civilization could barely keep up. The saying on everyones tongue was, Good-bye, God. Were going to Bodie! South of the town, where the incomparable Standard and dozens of other mines burrowed into Bodie Bluff, the barren hills echoed with the rumble of stamp mills and suffered through the fire and steam of Victorian industry. But . . . all mining booms end. Ore deposits play out, veins pinch to nothing, hopes fade, and disappointed investors finally realize theyve been pouring their money into holes in the ground. By the turn of the twentieth century, Bodie was a quiet village. By the late 1930s, it was a ghost. Fire, rot, and Sierra winters removed most of the buildings. In the early 1960s, a group of local notables got together and persuaded the state of California to help preserve what was left of the old ghost town as a state historic park. My wifes grandfather was among those notables. His name is on the bronze dedication plaque Mono County Supervisor Arch Mahan, Jr.
ARCHIBALD MAHAN, JR. came from a family with long and deep connections to Bodie and the Eastern Sierra. His father, Arch Mahan, Sr., was an argonaut of the twentieth-century variety, a college-trained mining engineer equipped with science and a Model T instead of dumb luck and a mule. As the mines of Bodie closed down, Arch Mahan, Sr. sought his fortune elsewhere among the Eastern Sierra crags. By 1919, he was sure hed found it in the heart of the Sierras not too many miles away from Bodie, in a lake-bedecked valley called Mammoth. Gold-seekers had been there before. In 1877, they had found a modest amount of high-grade 9,000 feet up, in a rocky notch adjacent to a dormant volcano. News got out and soon the optimistically-misnamed boom camp of Mammoth City was hammered together at the discovery site. The crest of the high Sierras was less than five miles away. When winter came, the new residents discovered a singular weather phenomenon as storm systems blow east over the mountains, they tend to shed their burden of snow on the country just beyond. As a result, the only practical way to measure winter snow depth in Mammoth is by the yard. This has made Mammoth famous in the present day, as the aforementioned dormant volcano, Mammoth Mountain, has become the site of a fashionable ski resort. The pioneers of 1880, to whom "skiing" was a strange Norwegian affectation, like eating lutefisk, had a less recreational outlook. It took one winter of heavy Sierra blizzards and thirty-foot snowdrifts before most everyone decided that the modest amount of gold in Mammoth wasnt worth the trouble. Those who hadn't left on snowshoes already skipped town as soon as the snow melted in June. Subsequent winters wiped out the abandoned town for good. In 1919, Arch Mahan, Sr. took another look at the old Mammoth diggings. He and his partners located about twenty new claims up and down the volcanic ridge on the east side of the Mammoth Lakes basin, within walking distance of the original Mammoth Mine. He dug several prospect holes, found good "color," and, like every mining entrepreneur in the Old West before or since, went shopping for investors. By 1927, he had them. Mahan and his partners gathered the claims into one operation called the Mammoth Consolidated Mining Company. He hired some miners from Bodie and drove a pair of tunnels 800 feet into the mountainside to intersect and follow a vein of rich ore. A small camp went up, with office, cookhouse, bunkhouses, assay office, blacksmith, powder shack, and separate cabins for the mine superintendent and the Mahan family. The Mahan's home was a sturdy log cabin of a type Lincoln would instantly recognize. The heart of the mines surface works was a modern ore-processing plant, with a ball mill to grind the ore to sand and a pair of shaking tables to separate the heavier gold ore from the waste rock, all powered by a huge 110-horsepower one-cylinder oil engine. Up the hillside was a big compressor powered by another oil engine, which supplied compressed air through pipes to drive the mines modern jackhammer-like drills. The setting for this little industry was, and still is, one of remarkable beauty the narrow valley above the lakes basin is covered with pines and surrounded by steep crags the color of rust and charcoal. Roaring creeks cascade over mounds of boulders left by ice-age glaciers and tumble into meadows filled all summer long with gold and purple wildflowers. Every hollow in the rocky terrain holds a small, placid, trout-filled lake. The granite ridge across the valley looks high enough to trip God himself and snow lingers in the ravines all year. Across the lakes basin, Mammoth Mountain looms like the sleeping volcano it is. After a few years, Arch Mahan, Jr. took over the running of the mine from his ailing father. Winters in Mammoth were as bad as ever, but since it doesn’t snow underground, the miners stayed on the job all year. Arch Jr., an athletic young man who had been a Stanford football hero in an age when football heroes were really football heroes, made the arduous round trip from Los Angeles to Mammoth every month during winter carrying the payroll, mail, and tobacco. Each trip took about a week. Since the plowed road usually ended in a snowbank at Bishop, the last thirty miles or so had to be done on snowshoes. Other supplies for the miners flour, sugar, groceries had to come by dogsled. THIS LASTED UNTIL the Great Depression. Banks closed, investors pulled out, and the Mahans had no more cash to keep their operation going. In 1933, Arch Mahan, Jr. mortgaged the family home in Santa Monica and headed north to give his miners their last payday. He took out a lease on a remote pack station across the mountain in Reds Meadows, close to Devils Postpile National Monument, and became a successful Sierra packer and tourist guide. Later on, he was elected Mono County supervisor and became a bank director. He was one of the leaders in the effort to preserve what was left of Bodie as a state historical park. By some strange twist of luck his granddaughter, Kristi, ended up married to an odd art student who spent lots of time poking around old ghost towns, exploring lost mines, and hiking the roadbeds of abandoned railroads. Yeah. Right. Me. The Mammoth Consolidated Mine endured the long, slow decay that invariably becomes the fate of Western mining establishments. The compressor shed burned, the mill was wrecked by an avalanche, and the office and cookhouse collapsed under the weight of fifty winters worth of snow. Still, thanks to the efforts of the Mahans and the caretakers they hired, the old camp preserved many standing buildings and old pieces of mining equipment another Bodie, in miniature. In the 1950s, Mammoth and the lakes basin began to be visited by auto tourists in summer and skiers in winter. Hiking the Sierras became the ultimate expression of New-Age California hipness. To accommodate the growing hordes of wilderness-seekers, the U.S. Forest Service built a paved road and a campground practically at the mines front door. Right over some of the original surveyed claims, in fact. Oops. When the present generation took over the mine, the U.S. Forest Service used the change of ownership as a pretext to try and invalidate the mining claims and restore the property to its natural state that is, tear down everything in sight (campground excepted) at the owners expense. Among the many flaws in their reasoning, as we saw it, was that in so doing they would be destroying the last remains of Mammoths mining history not to mention a big chunk of our own family history. Its time to cut the story short, so we will barely mention the five-year war with the Forest Service, the research behind it, the papers and presentations, the grant applications, the hearings, the phone calls and letters to judges, congressmen and senators, the confrontations with hostile bureaucrats ah, skip it. In the end, it was worth it. We won. THE MAMMOTH CONSOLIDATED MINE was rededicated in 1989 as a public historical monument, administered jointly by the Forest Service and the city of Mammoth Lakes. Drive up the road around the south end of Lake Mary. Turn into Coldwater Campground and drive past all the Winnebagos until you get to the Duck Pass trailhead. Walk under the Mammoth Mine sign and up the trail to the Forest Service information kiosk. Just past the pack trail crossing, the path swings to the left and uphill, and the old bunkhouses and cabins of unpainted wood appear out of the forest like a dream of the distant past. Cool breeze and cold water still flows from the mine tunnels. The wreck of the ore processing plant sits with the ore bin askew at a crazy angle. The giant oil engine and the big two-stage air compressor rest solidly on their foundations with rusted dignity. The self-guiding trail winds from sight to sight, from relic to relic. I and my family come to Mammoth Lakes every year to enjoy the beauty of the place and dream about what might have been. Theres still $3 million worth of gold left in the mountain. Unfortunately, at todays prices, it would take about $4 million in labor and equipment to get it out. The environmental destruction would be unforgivable. My wife Kristi and I camp out near the entrance to the mine, in the same spot for the last three decades, under the same big quartz-veined boulder that probably at times sheltered her great-grandfather. For all I know, samples chipped from that boulder may have ended up in Otts Assay Office in Nevada City. 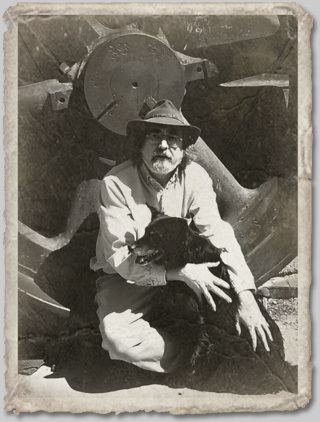 If you really want to know about the artist me consider that Im motivated by the same things that moved others in the past to wear out their boots on the Eastern Sierras a love of nature, a love of enterprise, a curiosity about what's out there, and the feeling that my fortune's hiding in one of those damned mountains. Just gotta find it. 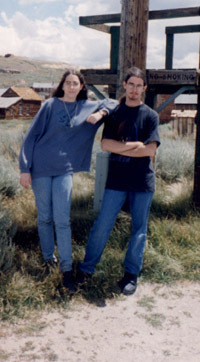 My ghost town kids They're both thirty-somethings now . . . Kira is a world-class Atlantic-hopping Irish fiddler. John is a cellist, master of the viola da gamba, and one of Orange County's finest music teachers.